Fit for a Pit carries clothing made by several different manufacturers. Each brand has its own sizing chart, so you'll find that a Large from Chilly Dog will fit your dog differently than the Large you got at a big box pet store. That's why we post measurements for all clothing and accessories right on each product's page! Click on "product details" and you'll discover all kinds of great information, including girth and length measurements. 2. While your dog is standing, place one end of the tape at the base of the back of the neck, run the tape along the spine, ending right before the tail begins (many dogs have a wide indentation there). This is your length measurement. 3. Now, for the most important measurement for deep-chested dogs: girth! Looking down at your standing dog's back, locate the widest part of the ribcage and wrap your measuring tape around it. This is your girth measurement. Would you rather see the measuring process in action? Check out this great video from our friend Louise Stapleton-Frappell! She's a force-free dog trainer and mum to Jambo, who is the world's first and only Staffordshire Bull Terrier to become a Champion Trick Dog! He is also our best product tester and quite the supermodel. 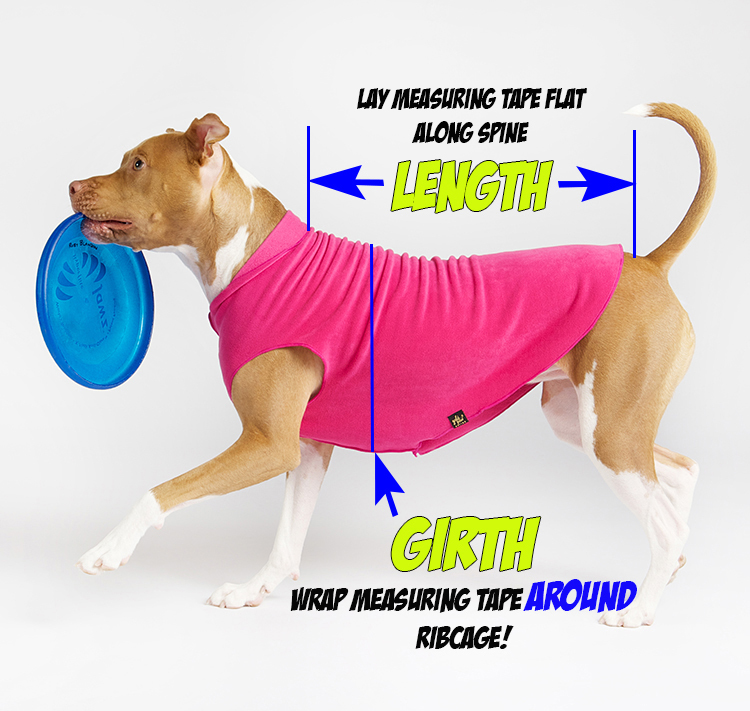 Using a cloth or paper tape measure, wrap the tape around the meatiest part of your dog's head. Start out with your dog standing on blank sheet of paper, on a hard, flat surface. Make sure your dog is bearing weight on the paw while you measure. For width, make 2 marks on the paper: one at the outside edge and one at the inside edge of the widest part of your dog's paw. For length, mark where your dog's longest toenail ends and another mark at the very back of the largest paw pad. Measure distance between your width marks and length marks.